Sunday afternoon in Houston, the Rockets completed their surprising series comeback against the Clippers to advance to the Western Conference finals. Normally, a 2-seed getting to the NBA semifinals is not particularly noteworthy, but anytime the Rockets do anything, it means it’s time to discuss basketball analytics again. This is groan-worthy for many reasons, but that won’t stop the partisans from assuming their positions and treating us all to another cycle of reheated takes on the virtues of numbers and hoops. Whether he wants to be or not, Daryl Morey is the poster boy for analytics in pro basketball, and though analytics have infiltrated virtually every front office in the league, Morey’s successes and failures still must also be referenda on the state of analytical reasoning in the NBA. Morey became general manager of the Houston Rockets in May 2007. Eight years and what seems like 10 million transactions later, they are the furthest they’ve been with him at the helm. The last time the Rockets made it to the Western Conference finals was 18 years ago, with a team led by Hakeem Olajuwon, Clyde Drexler, and Charles Barkley. Maybe it’s ironic that Barkley attempted to verbally eviscerate Morey early this season, and maybe it’s not, but it’s definitely poetic justice that Barkley will have to bite his lip and continue to analyze Morey’s team as it competes in the NBA’s final four. Barkley’s midseason rant was all the talk at the 2015 MIT Sloan Sports Analytics conference in Boston this February. It’s a conference that Morey cofounded with Jessica Gelman nine years ago and has tellingly exploded in popularity ever since. The idea that analytical reasoning has no place in basketball is so ridiculous that it barely warrants recognition. Yet if Barkley’s tirade taught us anything, it’s that there are still people out there who think this way. And that itself is an issue that challenges us to examine why basketball lifers like Barkley have come to adopt such an extremist dogma. Make no mistake, Barkley may be the most prominent proselytizer, but he’s not alone; his viewpoint is shared and echoed, albeit in more nuanced terms, by many coaches and decision-makers in the NBA. The truth is that if the 2015 Rockets are symbolic of anything, it’s that it takes all kinds of genius to make a really good NBA team these days. From player development and coaching to scouting, drafting, and transacting, good franchises are good at a lot of things, and number-crunching is a useful component in many contemporary front-office tasks. Morey spearheads a forward-thinking front office that has built a sustainable enterprise, and while there’s no question analytics are part of that, they’re by no means lonely. Perhaps the most revealing lapse in Barkley’s analysis came when he unknowingly praised Morey, the wheeler-and-dealer. Check out the convenient pronoun usage there. Who are they? Morey is they, and “they” pulled off the best trade our league has seen this century when “they” flipped Kevin Martin and what turned out to be Jeremy Lamb, and picks, into that bearded breakfast defector who happens to be one of the best players in the NBA right now. You might argue that the James Harden trade had little to do with analytics, but something tells me that Houston’s little intelligence agency did a bit of quantitative surveillance before deciding to pull the trigger. Furthermore, that trade — and the preceding transactions that enabled it — set the table for luring Dwight Howard a year later. 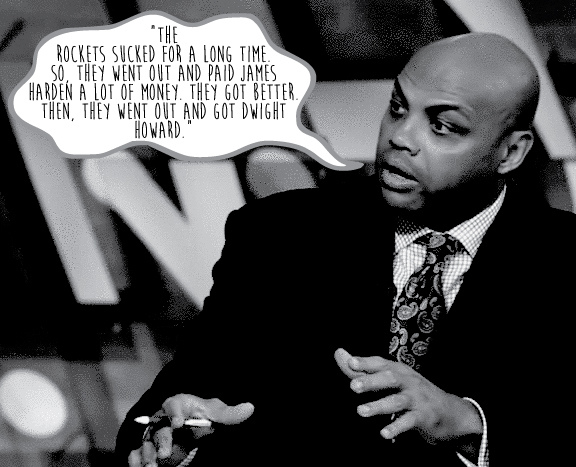 Howard had options, but he chose Houston, in part, because of Harden. Morey’s Rockets résumé has more than those two bullet points. He may have lost the Chris Bosh sweepstakes and let Chandler Parsons walk to Dallas, but by grabbing Trevor Ariza and Jason Terry he landed two savvy vets who have contributed a lot for much lower costs. In addition, he could’ve appeased the hot-takers and fired Kevin McHale, but he didn’t, and that proved wise, especially after he acquired Josh Smith and Corey Brewer in the middle of the season. McHale somehow assimilated those guys, turning Smith into a playoff difference-maker who resembles a madman’s Boris Diaw. This team has survived numerous injuries, insults, and death pronouncements, and is still alive and kicking as we approach Memorial Day. It’s incredible. It should be clear to anyone paying attention that Morey is far from a one-dimensional numbers nerd who happens to run an NBA team; he’s one of the league’s smartest managers, and in the midst of the big-data era, like every other successful decision-maker, he’s not about to turn a blind eye to computation or statistics. 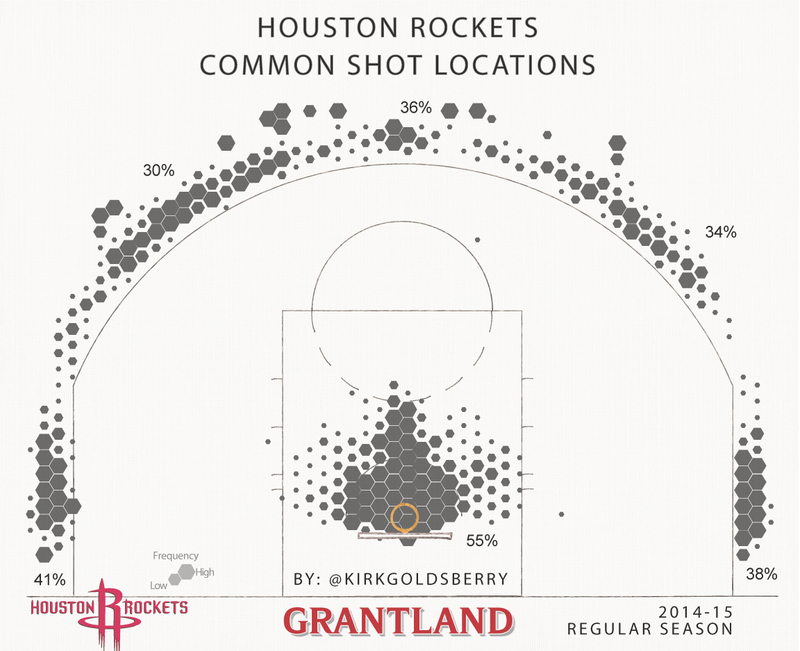 Still, at least from a stylistic standpoint, the defining trait of these Rockets might be their progressive shot selection. And it speaks volumes about Morey that he’s been able to translate what started as an idea at Sloan into a viable offensive strategy we’ll all be watching in the freaking Western Conference finals. 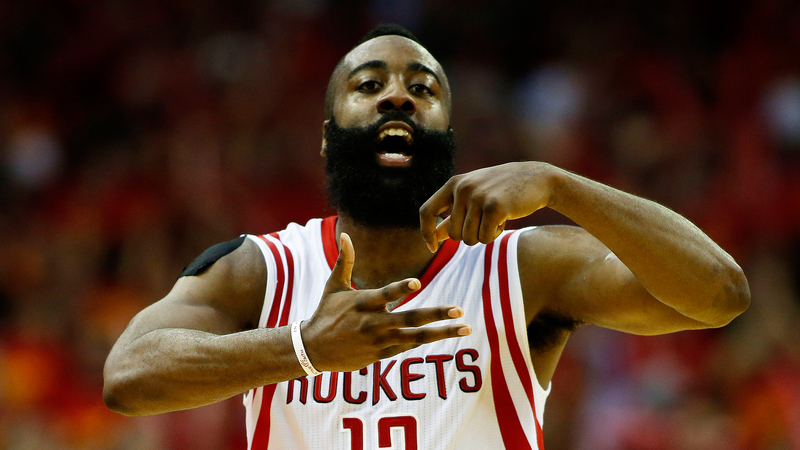 Regardless of which team wins this series, the 2014-15 Rockets will have a legacy. More than any other team, they make us think about how the rules of the game and the lines of the floor affect the way the sport is played. You can argue that they play ugly basketball, and you might be right, but you can’t argue that they don’t play really smart basketball. They exploit loopholes and margins better than any other team, and last I checked, that’s generally a smart competitive strategy in any game. As I wrote in January, It’s not Morey’s fault that the league decided to paint a magical arc on the court that not only drastically inflates the value of a 24-foot jump shot, but also deflates the value of midrange jumpers and makes paint shots the only sensible 2-point shots on the floor. And it’s certainly not his fault that getting a good free throw shooter to the free throw line is secretly the most effective play in professional basketball.1 There are three smart places to score on the court right now: beyond the arc, near the rim, and at the free throw line. These are the rules, and Morey has gone out and built a team that exploits those rules. Howard is obviously a beast near the rim; Harden is a master rim attacker, jump-shooter, foul-drawer, and 3-point assister; the rest of the squad is more than happy to decorate the perimeter and shoot 3s all day long. If you hate the way the Rockets play, your problems aren’t with Morey — they’re with the competition committee and the league office. And if you hate analytics? Well, go root for the Lakers, who have an 82.8 percent chance of keeping their lottery pick tonight. 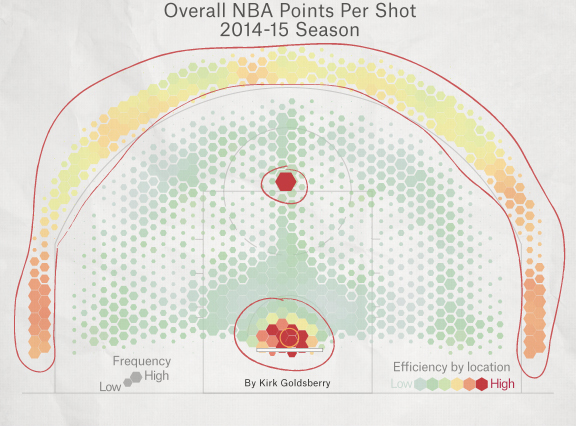 Getting Kyle Korver an open 3 is worth approximately 1.5 points; getting Harden two shots is worth more than 1.6. Miami’s Gamble: What Does Tannehill’s New Contract Mean? UEFA Is Changing Financial Fair Play? Wait, What Exactly Is Financial Fair Play?